Medal Mania | Features | Kids VT - small people, big ideas! When the 2014 Winter Olympics kick off in Sochi, Russia, this February, some young Vermont athletes will be watching especially closely. The state has produced a number of past competitors — from skier Barbara Ann Cochran to snowboarder Ross Powers — and plenty more long to take home a medal for their achievements. Kids VT spoke to three young Vermonters who are pursuing their Olympic dreams. Two of them live part time at the U.S. Olympic Training Center in Lake Placid, N.Y.; the other recently relocated temporarily to Sweden. They juggle days full of rigorous training with evenings keeping up with schoolwork. Tara Geraghty-Moats, Elijah Pedriani and Megan Nick have been athletic from an early age, but none of them started out pursuing the sports they now hope to take to the Olympics. Faced with injuries and unexpected opportunities, they all adjusted their aims — good news for kids who haven't settled on a sport by kindergarten. 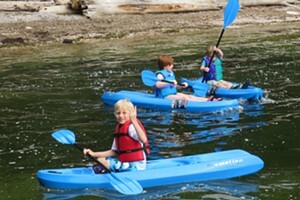 These young athletes may not end up on the U.S. Olympic team in 2014 — Kids VT went to press before the Olympic trials — but they're training around the clock. Two of them hope to make the 2018 Winter Olympics in Pyeongchang, South Korea. Read on to find out what it takes to forge a path to the biggest stage in amateur athletics. When Tara Geraghty-Moats launched into her first ski jump at age 9, she says, it felt like flying. By 16 she had made the junior development team — one step below the junior national team. She dreamed of competing in the Olympics. "I always loved being in the air, whether it was jumping off the bed or into a lake," says the West Fairlee native. "I thought it was really cool that there was this sport that fit my personality. I was a bit of a mischievous kid, and it challenged me to use that side of me in a productive way." Jon Farnham, one of Geraghty-Moats' first coaches at the Lebanon Outing Club, remembers, "She was one of the kids that got the most jumps at practice." Most ski-jump hills don't have lifts; if you want to go again, you've got to hike. "You can tell if a kid is really enjoying themselves if they're climbing up the hill as fast as they can to get another one," Farnham says. As a kid, says Geraghty-Moats, "being in the air gave me a lot of trust in myself. I was proud that I could do something that no one else could do." That notion was challenged in 2009, when she suffered a knee injury at 16. A couple years later, it happened again. 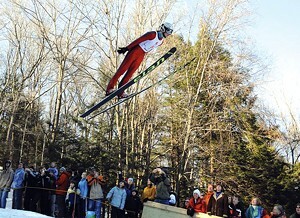 The teen was told she might have to give up ski jumping for good. Instead, Geraghty-Moats switched gears to a new sport that took advantage of her Nordic skiing training: biathlon, which combines cross-country skiing and target shooting. She didn't have any experience with guns, so she had to learn to shoot. "You have to make a plan for your race so you don't ski too hard, so you can calm down to shoot well," Geraghty-Moats says. 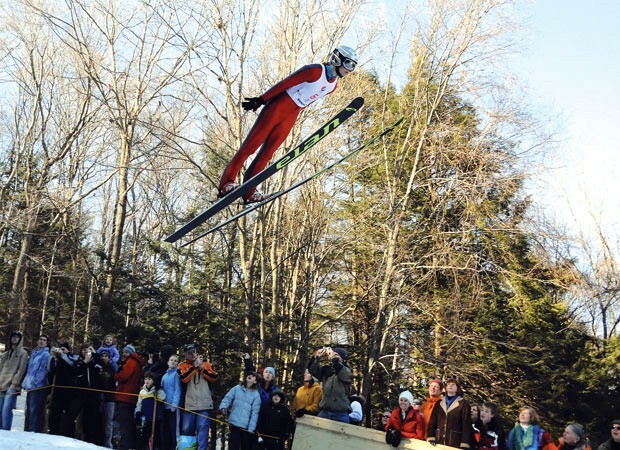 "With ski jumping and shooting, you need to be able to fine-tune your movement. A millimeter in bullet placement can really change the outcome of a race." Now she's pursuing biathlon with the same dedication she brought to ski jumping. In 2011, Geraghty-Moats made the junior national team; last year she was part of an exchange with the Swedish national team, and in December she'll go to the first round of Olympic trials. Still, Geraghty-Moats, now 20, misses getting airtime. "I was always sad that I'd gotten injured," she says. Last fall, just to see if she still had it in her, she participated in a national ski-jumping competition at Lake Placid — and came in fifth. "It was an amazing feeling to get it back," she says. "I know that I'll continue to jump; there's no question." Which sport will she pursue long-term? "I'll make that decision in the spring," Geraghty-Moats says. Elijah Pedriani was 12 when he first saw skeleton racing in the 2010 Vancouver Olympics. 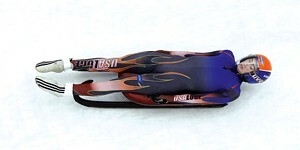 The high-speed sport involves careening headfirst down an icy chute on a tiny sled. Pedriani thought it was the coolest thing — so he built a course of his own in his snowy New Haven, Vt., backyard. When summer rolled around, his mom heard that the USA Luge Slider Search was coming to Plattsburgh, N.Y., to recruit young athletes for its development team. Luge is similar to skeleton except that sliders go down feet first, steering with their calves. "We showed up not knowing what to expect," recalls Pedriani, now 16. "I sat down on some wheeled sleds and went down a paved road and weaved through cones and stuff." He had no experience beyond his backyard experiments. But the young slider took to it immediately. "Every time I went down, I just had a smile on my face," he says. "It's like extreme sledding." A couple of weeks later, Pedriani got a letter inviting him to spend a week at training camp, which led to a second tryout camp, and ultimately led him to compete in youth nationals. After a year of training, he earned a spot on the U.S. junior development team. These days, Pedriani lives primarily at the dormlike Lake Placid training center — two or three weeks there, one or two weeks at home in Vermont. He remains a full-time student at Mt. Abraham High School, meeting one-on-one with his teachers to create an academic plan for the year. His parents pay an annual fee for the luge program. In Lake Placid, Pedriani trains 12 to 15 hours every day, on the ice and off. Great sliders don't just hold on for dear life as they whiz down the ice, he says; they know when to roll their shoulders, tilt their heads and counter the pressure of a curve. "When you're flying down the ice, you get this feeling that's unlike anything else," Pedriani says. "It's like riding a roller coaster, except you control where you go." Pedriani hasn't made it to the national team yet, but he's hoping to qualify in time for Pyeongchang in 2018. That'll be his best chance to compete on the world stage in his unusual sport. "You get a cool vibe in Lake Placid," Pedriani says. "Everybody has the same feeling. It's sort of like hope, or a dream. Everybody's there to eventually go to the Olympics. Everybody has that power, that drive." Megan Nick always dreamed of going to the Olympics — in the summer, for gymnastics. She started the sport when she was 3. In ninth grade she gave up skiing so she could pursue her passion. But last summer, on a whim, the 17-year-old submitted a video application to the U.S. 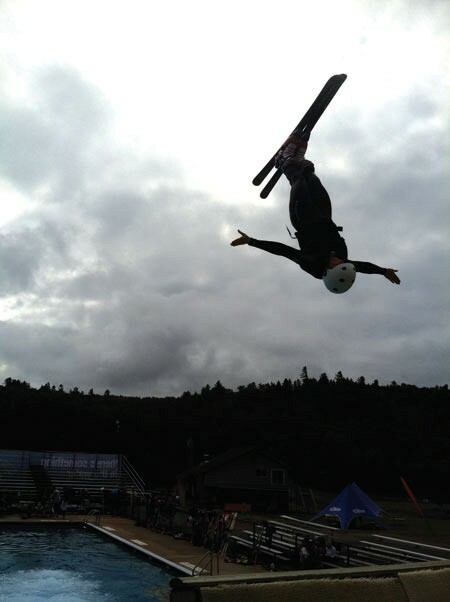 Ski Team's Elite Aerial Development Program, and became one of six youngsters from around the nation to make the cut. Remarkably, two of the others are also from Vermont: Tyra Izor and Kira Tanghe. The aerial program seeks out gymnasts because, coaches claim, it's easier to teach them to ski than it is to teach skiers to do flips. Since she moved to the training center, Nick — a natural flipper — has literally thrown herself into the deep end of aerial skiing. Training has included skiing down a long, wet ramp — kind of like a ski jump — and flipping through the air into a pool churning with bubbles, which cushion the skier's impact. While airborne, Nick keeps her body straight and her skis tightly together as she rotates a full 360 degrees. She's currently in Park City, Utah, somersaulting onto snow for the first time. All of that training has positioned Nick to one day compete in the Winter Olympics. She's hoping to make the team in 2018. Nick's mom, Colleen, says she is thrilled for her daughter — and anxious, too. A senior at Champlain Valley Union High School, Nick is taking a few courses independently so she'll be able to graduate with her class this spring. But the Aerial Development Program — which is free for the Nick family, except for equipment and travel costs — lasts two years. "So, do you put college on hold?" her mother wonders. Colleen Nick says it's also difficult to let go of her youngest child; Megan's two older siblings have already left home. "I was kind of looking forward to this senior year," Colleen says. "I wasn't looking forward to becoming an empty nester a year early." Injuries are another concern. Colleen shudders when she recalls watching her daughter compete in gymnastics with a broken hand. She says it's nerve-wracking to imagine Megan landing somersaults on skis. "But I'm excited for her," she says. "I think her dream was always to take gymnastics to a new level, and this is a way for her to use some of those skills through a different avenue." What if Megan Nick doesn't make it to the Olympics? "It's a possibility," Megan admits. "Depending on the year of the Olympics and how good each freestyle ski team is, maybe only one female aerialist gets to go. I've definitely thought about it, but this is still a great opportunity. The Olympics would be awesome, but I still get to do this."